Ben is a highly experienced and hugely well-respected stand-up. He’s been performing comedy since 1993 and is renowned for his incredibly relaxed stage persona and his innate ability to improvise as well as deliver sharply crafted material. Ben was Ed Byrne’s tour support for his 2013 UK tour and appeared at the Apollo, Hammersmith. Ben acted in a play developed with the ‘Comedians Theatre Company’ called ‘The last minutes’ which was broadcast on BBC Radio 4 in February 2014. The term “circuit legend” is overused, but Norris is one of a handful that have been headlining for more than two decades and rarely departs a stage without leaving it torn to shreds in his wake. A master of the craft, this will be an hour of the most polished stand-up you are likely to see. Ben Norris may not be a household name, but then very few really good comedians are these days. 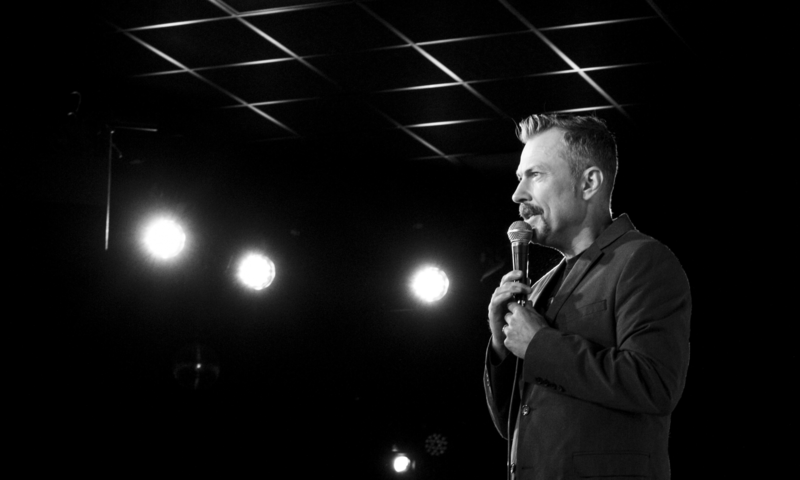 The London-based stand-up has been touring steadily for the past two decades, and he’s developed a razor sharp act in the process ; with the notable exception of Jason Byrne, it’s hard to think of anyone on the circuit who works an audience with as much skill and flair. With 20 years on the clock, Norris is one of the most bankable headliners around and is a brilliant improviser. Blokey observations, but not always what you expect. He’s an outstanding improviser, and when the comedians get together to play football he does the funniest commentary. We had great feedback from a number of our guests including the sponsors which always helps so all in all very happy. Impressed. I admit that booking a comedian for a corporate event can be a risk, you have to know your audience to be confident that it will go down well, and you also have to do your best to know your comedian. I saw Ben first at the Edinburgh fringe in 2013 and was impressed at his smart brand of comedy. The booking was straightforward and Ben arrived early to see the venue and a chat beforehand, he adjusted his material to make it specific to our event and worked with us to make adjustments in the venue and introduction which enhanced the experience for all. Having introduced Ben I sat at the back of the room and observed everyone have a great time, relaxing more as he worked the audience with respect and a complete absence of offence to anyone, Ben is a pro and many of my colleagues were wiping away the tears as they laughed heartily, he will take his humour to the boundary and then step back, the humour is adult, more so in this evening show vs the fringe daytime show I had seen, but always smart with no cheap gags. Thanks Ben for two successful shows, I received many comments afterwards from the audience on how much they enjoyed their night. We had great feedback from a number of our guests including the sponsors which always helps so all in all very happy.